One more member of the state Legislature has been identified as a cheap crook. 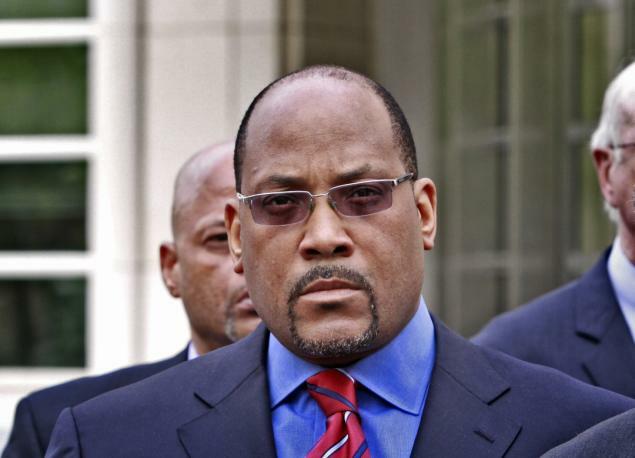 There was money to steal so Brooklyn state Sen. John Sampson took it and then he pulled strings to cover the theft, according to federal prosecutors. In the last few weeks, Manhattan and Brooklyn U.S attorneys charged a senator with trying to bribe his way onto the mayoral ballot and accused an assemblyman of selling legislation. An assemblyman and a senator have worn wires for the FBI to catch fellow elected officials in corruption — after both the wire-wearers got bagged for crimes themselves, one for election fraud, one for stealing public money. Before that, a senator took a million dollars in bribes, an assemblyman embezzled hundreds of thousands of dollars earmarked for nonprofit groups and the notorious Pedro Espada gouged the Medicaid program. As told by top Brooklyn prosecutor Loretta Lynch, Sampson got himself appointed a foreclosure referee, a patronage court appointment that’s open only to the connected and is shamefully underpoliced by the judiciary. Placed in a position of power with scant oversight in a culture where money is there to be played with, Sampson went for the bucks, like so many New York politicians have. Yet the Legislature does nothing but gripe about bad apples. Leaders like Assembly Speaker Sheldon Silver, Republican Senate leader Dean Skelos and Independent Democratic Conference leader Jeff Klein have been in the money swamps for so long, they can’t see the connection between routine muck and corruption. Gov. Cuomo has proposed a reform agenda. With no particular urgency, the Legislature has responded with measures that can be trumpeted as designed to clean up Albany while getting lost in legislative bickering. Actually, the Legislature’s duty is clear. The standard of proof demanded by New York’s bribery statute is so high as to be insurmountable. The law must be rewritten to conform with the more effective federal statutes. Failure to report bribery must be criminal. New York’s grand jury rules hobble state prosecutors when conducting investigations. They should be revised to give state probers powers that match those in the federal system. Controlled by political bosses, the state Board of Elections has given up on enforcing New York’s campaign finance laws. The state needs an independent monitor with full subpoena and prosecutorial authority. Legislative slush funds, called member items, must be permanently abolished. The regulations governing who can seek a party’s nomination to run for office must be relaxed in order to diminish boss rule and the power to make inordinate demands. The Legislature must get its nose out of financial decisions that belong properly to the governor. Most important right now, Silver, Skelos, Klein & Co. must set the broad legislative framework for the distasteful arrival of casino gambling and leave Cuomo to issue franchises and decide where gambling meccas are best located. So much money will be at stake there’s little doubt that lawmakers will undermine the credibility of a selection process, if not its integrity.